I had written this poem ("The Old Man And His Troop") in Hindi a long, long time back and then lost it completely...don't know how! Years later I translated my feelings into an English verse which can be read here. As with all my other poems, this one also had collected dust with the passage of time but for a recent comment that I received on it. 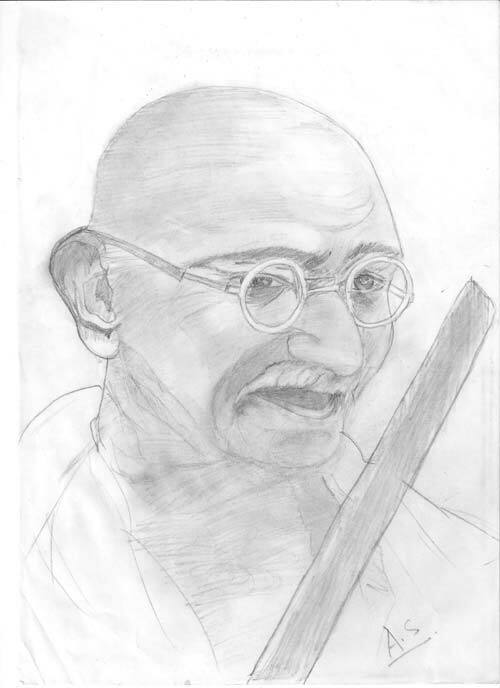 I had attached a hand-sketched photo of Bapuji along with the poem, which was available on Google, not knowing that it belonged to AS till she left a rather stilted comment about my trespass into her art world although completely unknowingly. I wrote back to her saying so and promising that I would leave a link to her post in my blog so that I am exonerated of all charges of cyber theft and all that. In doing so, I also realize how absolutely within her rights she is to have demanded an acknowledgment of her work, however easily accessible the same may be on the net, by all and sundry and howsoever naive she may have been not to know that anything on the net invariably loses exclusivity and becomes everyone's property. Least be said about yours truly whose lack of net-savviness ( if there be any word like that in the English lexicon) disallowed her to trace back the sketch to the artist's blog. However, having regained the dwindling grains of self esteem, I dedicate this post to my new-found artist-friend AS whose talent I openly admire. I had once written a short story which was influenced by my intense desire of becoming a painter alas in vain as I cannot even hold a pencil properly let alone paint something which may sensibly depict artistry of any sorts. Anyhow, leaving aside all the lame laments and poor excuses I have decided to publicise my naievety and my fellow-blogger's talent with the brush by putting up this post on http://indiblogger.in with the hope that this act of mine will assuage the pangs of guilt that I am now suffering from regarding the unintentional lifting of the sketch. Honouring my own decision, I also wanted to put up the long-lost Hindi version of the poem, a shorter version and the vague recollection of the same that I have had in my memory. However, as I sit down to pen it I find my memory playing truant with me and much as I try I cannot bring out a word-to-word translation of the poem written in English ( Again, the English version was not a word-to-word translation of the original one written in Hindi). I suppose I must accept the fact that cadence once lost is lost forever and there is no point trying to dish out facsimiles of the same. Instead fresher thoughts invade and prevail...thoughts which are of this day and somewhat take over from where I had ended last...though whether it presents a grimmer picture is for the reader to decide. So, I give below my thoughts of the day. Hope you all will be able to relate to the same and enjoy AS' handiwork as well. "मैं दूंगा तुम्हें आज़ादी बिना रक्तपात"
अब भी थोड़ी उम्मीद है बाक़ी "
चीड़ हरण रोक न पाया मैं, अफ़सोस ! दो चार गाँव बसाने का ..
भरी अपनी झोली मदद के नाम पर… "
सिर्फ दो क़दम की दूरी है स्वनिर्भरता से.…"
This was an amazing composition .. I am falling short of words to praise this ! !